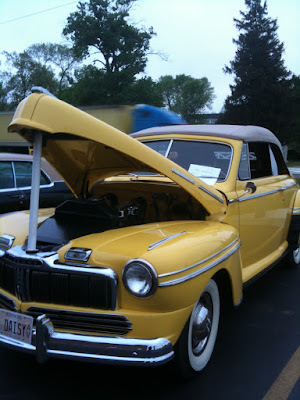 Joe’s Place in Marengo hosts a Wednesday cruise night. Advertising & Marketing Director Tyler Kunde invited us to stop by for the event and treated us to dinner. Classic cars, shiny, clean and polished lined the front of the building and a DJ spun golden oldies on the sound system. Cruise nights run Wednesday all summer long. Bring your car to show off or enjoy the rides parked out in front. Dan’s Custom Exhaust in Marengo sponsors the series. Joe’s Place has been in Marengo for 16 years. The new, spacious location on Grant Highway was built two years ago. The building seemed so large and I was surprised at how comfortable it felt inside. The main dining room tables and booths were filled with families sharing a meal and swapping stories about their day. The casual atmosphere contributed to the smiles and laughter all around us. Peaking at the surrounding tables, pizza, sandwiches, burgers, hot dogs, ribs, soups and salads all looked good. We had the grilled vegetable Panini sandwich and Italian beef sandwich with a huge basket of fresh cut French fries. The food came up piping hot and fast. We both enjoyed our tasty meal. Next time I plan to try the Spinach & Strawberry with fresh spinach, strawberries, walnuts, red onions, dried cranberries, goat cheese & raspberry vinaigrette. Combined with a bowl of their homemade vegetarian minestrone soup would make a satisfying meal. Or maybe the Penne a la Vodka Sauce. Or pizza! Short on time for dinner? Joe’s Place has you covered! Carry out a pizza or take your sandwiches to go. Joe’s also offers catering so you can relax and enjoy your party. Just inside the door is the butcher shop. Meat, cheeses and salads are displayed attractively in long glass cases for your home cooked dinner. Butchers gladly help you select your custom order and even provide cooking instructions on request. Vienna Beef products are featured. The butcher shop supplies the meats for Joe’s restaurant. Upstairs the banquet room seats 200 for weddings, graduation or other events. “On the 2nd and 4th Friday of the month, come upstairs for a jazz band, cocktails and dinner. “ Tyler said. “The place is really hopping.” The lower level banquet hall seats 75 people. Joe’s Place in Marengo is a comfortable family spot for lunch or dinner seven days a week. Visit Joe’s Place Marengo on the internet, Twitter or Facebook for more menu, coupons and updates.